Isetan (Singapore) Limited, together with its subsidiaries, operates department stores and supermarkets in Singapore. The company operates in two segments, Retail and Property. Its stores offer a collection of fashion designer lines, cosmetics, and family-oriented merchandise for the local and tourist markets, as well as Japanese lifestyle concepts to the Singapore market through various food festivals and promotional activities. The company also offers online shopping services, as well as owns and leases properties. It operates stores under the Isetan Scotts, Isetan Katong, Isetan Tampines, Isetan Serangoon Central, and Isetan Jurong East names. The company was formerly known as Isetan Emporium (Singapore) Private Limited and changed its name to Isetan (Singapore) Limited in 1981. Isetan (Singapore) Limited was incorporated in 1970 and is headquartered in Singapore. 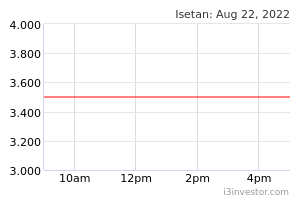 Isetan (Singapore) Limited is a subsidiary of Isetan Mitsukoshi Ltd.